With a gorgeous Swarovski disc as the centerpiece, this necklace combines bead weaving with basic stringing. All the bead supplies are available from Artbeads.com. I found it easiest to create the bead woven bail first, and then to string up the necklace. 1. Thread a long piece of Nymo O onto a beading needle, and pick up enough 11/0 seed beads to create a bail the length you want. 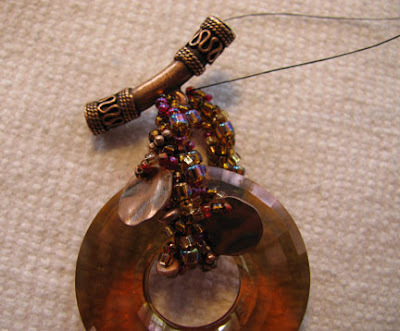 Go through the loop on the tube and the Swarovski disc, and knot the thread well in the back. Glue the knot and clip ends after it dries. 2. 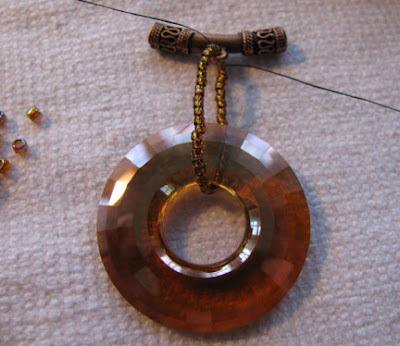 Using the directions for the Spiral Stitch, add various colored and sized beads all around the inner core. Instead of adding core beads with each stitch, the 11/0 bead loop you created in step 1 will be the core. 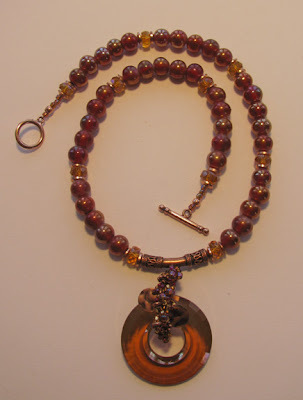 Stitch a couple of small seed bead loops to dangle the copper discs in the front as you work your way down the front. 3. Crimp the beading wire to one end of the toggle clasp. String enough beads to equal about half the desired necklace length. Take into account the length of the copper tube too. 4. String on the tube with the beaded bail and repeat the pattern for the other half of the necklace strap. Crimp the wire to the other end of the toggle clasp. Cover the crimps with copper crimp covers.